All pupils with PWS require some level of additional support at school and many children receive ORS funding or School High Health Needs Funding. The areas in which support will be required include learning, behaviour and safety around food. Some children score within normal range in cognitive testing (borderline to low average), but most children will have mild to moderate intellectual disability. Regardless of intellectual ability, all children experience some learning difficulties. In spite of this, pupils with PWS are usually hard-working, enthusiastic learners who are keen to succeed. Expressive language delay – verbal ability may be good, but articulation difficulties can continue, and sometimes apraxia. Allow extra time for communicating and to practise new words. Please refer to the Abilities and Learning section of our Teachers’ Pack for further information. Children with PWS like rules and consistency and can therefore thrive in the school environment. Nevertheless, understanding the underlying anxiety and stress sensitivity in PWS are key to preventing any unwanted behaviours. An increase in anxiety may directly correspond to an escalation in behaviours such as obsessive thinking, rigidity and non-compliance. As emotional control is impaired by the disorder of the hypothalamus in PWS, it is therefore essential to manage the classroom environment in order to reduce stressors and minimise anxiety. Pupils with PWS do not learn from negative behavioural consequences or respond well to consequences that might work well for other pupils. However, they do respond well to positive behaviour management. Difficulty in thought and task switching – use visual cues, countdowns, modify task lengths and set time limits for talking on a topic. If repetitive questioning occurs with rising anxiety, answer specifically, reassure, check understanding, then redirect or limit number of questions. Tenuous emotional control – avoid false expectation and disappointment, encourage communication and assist with identifying emotions and taking appropriate action. Use a calm down area or tools, praise efforts to control emotions, avoid reasoning attempts if ‘meltdown’ occurs and reflect later on when they are ready. Socially inappropriate behaviour – pupils may lack social awareness of what is appropriate in some situations, so clear rules are needed. Model, cue and frame social interactions to build social / conversational skills. Please refer to our Behaviour page and the Behaviour Management section of our Teachers’ Pack for further information and resources. Individuals with PWS have an altered body composition so their dietary intake needs to be reduced from around 2 yrs old to avoid rapid weight gain. However, they also develop an increased appetite from around age 4.5yrs and hyperphagia from around age 8 (abnormal desire for food / excessive appetite). This drive to eat can preoccupy the mind, raise anxiety and distract their focus from play and learning. A method called ‘Food Security’ not only controls weight by preventing unauthorised access to food, but also reduces associated food anxiety and behaviour. By storing food securely and using this method, expectations are not raised and temptation is removed from sight and mind. Another important reason for controlling access to food is to prevent the possibility of a large volume of food being quickly consumed which increases the risk of choking or a perforated stomach lining. Supervision around food is necessary. 'Food Security' is a method taught for managing hyperphagia and behaviour by Drs Forster and Gourash, The Pittsburgh Partnership. Opportunities for unauthorised access to food are eliminated, i.e. inaccessible area for lunchboxes, lunchtime supervision. All staff understand the dietary needs and supervision requirements of the child with PWS. All pupils know not to share food and to be consistent in saying no to the child with PWS if they ask for food. No suggestions or promises of extras are made; food treats are not used as incentives / rewards. The pupil is aware of the schedule for morning tea and lunch and is forewarned if any changes to the food schedule are made. The older child does not have access to money to buy food without permission. They are supported to make appropriate, healthy choices when this is allowed. 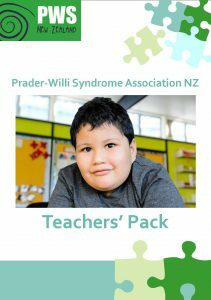 Download our Teacher Pack, or to order a copy, please visit our Publications and Resources page. The pack also contains an editable A4 pupil profile template to share with school staff and relievers. Don’t Stop Speech Therapy – article by Lisa Graziano, PWSA(USA). Includes information on apraxia.